Do you want to know about Mount Bromo of Indonesia? Let's Travel to Mount Bromo - Indonesia. Mount Bromo. Bromo derived from Old Javanese, Brahma, which is one god in Hindu religion. For the people of Tengger Tribe, this mountain is a holy mountain, so each ceremony is held once a year or Kasodo Yadnya Kasada, the ritual of throwing the earth into the crater of Mount Bromo as offerings. This ceremony is held at midnight to early morning every full moon Kasodo (tenth) according to the Javanese calendar. Through this ritual Tenggerese an abundant harvest beg or ask for reinforcements and starting the healing of various diseases. Mount Bromo is an active volcano that is part of Bromo Tengger SemeruNational Park (TN-BTS). National park which was inaugurated by the government in 1997, has an area of ​​5250 ha of sea sand and located at an altitude of ± 2100 m above sea level. Sea of ​​sand is part of the ecological history of the formation of Tengger caldera region. Mountain with an altitude of 2392 meters above sea level is renowned for its expanse of sea sand and a vast crater of the mountain. From the top of Bromo, visitors can see the gaping crater width with a puff of smoke coming from the bottom. This crater has a diameter of ± 800 feet (north-south) and ± 600 meters (east-west). From this place, too, visitors can witness the beauty of the panoramic expanse of sea sand with a charming natural silhouette. Visitors can also enjoy the sun (sunrise), exploring the journey on horseback, and enjoy warm beverages and a bonfire against the cold. In addition to natural attractions, visitors can also taste the cultural tourism by following Kasada Yadnya ceremony held between the months of December to January. 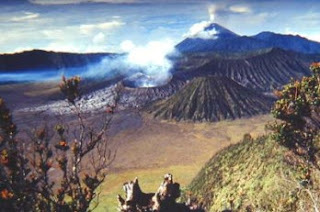 Mount Bromo is located between the Kabupaten Pasuruan, Probolinggo, Lumajang, and Malang, East Java. However, an administrative area is part of Probolinggo district. Mount Bromo can be reached by private vehicle or public transportation. 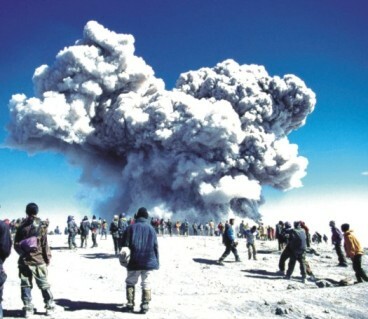 To reach Mount Bromo, visitors can take two routes. First, the "western gate" of the direction of Pasuruan. Travelling through the west door is fairly heavy due to impassable by ordinary 4-wheel vehicles, except by hiring a jeep. Through this route tourists usually choose to walk from village to Mount Bromo Wonokitri with a distance of about 13 km. Second, through the "north gate" from the direction of Probolinggo. Through the second door, the tourists can use any vehicle, including riding a motorcycle because the road that passed not too steep. If tourists want to see the sea of ​​sand, it is advisable to go through the north door. Conversely, if the desired is watch the sunrise, it is more practical through the west door. The nearest village from the direction to reach Bromo Probolinggo is Cemorolawang (± 45 km from Probolinggo). This village can be reached by using public transportation from Probolinggo. From Cemorolawang toward Bromo visitors can rent horses, jeeps, or on foot. In addition to walking, to facilitate the ascent of the climbers to hire "motorcycle taxi" horse and jeep vehicles. Because the air temperature ranged between 20-20 0C, then the visitor can also enjoy drinks and a bonfire provided by the small shops nearby. If forced to stay, do not worry because a variety of lodging types ranging from shelters, hostels, to hotels available around Bromo. A variety of restaurants, cafes telephone, souvenir shop, mupun public toilets are also available on this site. To get to the top of Bromo has been provided from the concrete stairs.